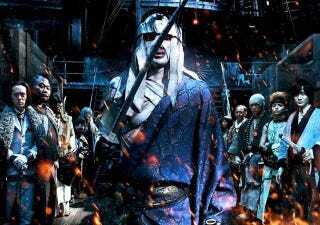 Rurouni Kenshin 2014 sequels release dates CONFIRMED!! Left to right: Hoji, Iwanbo, Usui (Bishop from Kamen Rider Kiva! ), Henya, Fuji (Not a giant), Shishio, Katamari, Saizuchi (Gentle from Kyoryuger! ), Anji, Cho (Ankh from Kamen Rider OOO!! ), Sojiro. The live-action Juppongatana. And said dates are very close to each other!! Great Kyoto Fire's out 8/1/2014 while End of a Legend's out on 9/13/2014! Both movies are based on the Kyoto arc of the franchise!! I could calculate that the home video dates for the double sequels could be right around December 2014 and/or January 2015 based off the 3-month wait of the original movie's theatrical release to the dvd release. That said, this is bound to be freshly awesomesauce! !